Mulberries are one of major and popular medicinal herbs in Traditional Chinese Medicine, which believes it can enrich kidney and liver, and are good for your eyes and hair. These white mulberries (Morus Alba) are sun-dried, sweet and very nutritious. 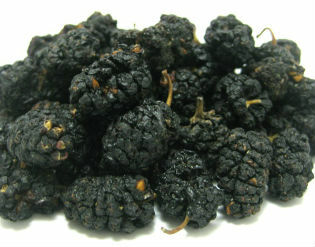 Mulberries are rich in nutrients such as Vitamins C and K, iron, calcium, and fibre. They are also full ofantioxidants, in particular the antioxidant resveratrol, which is a natural antibiotic produced by plants to attack infections, bacteria, and fungi etc. Given its sweet nature, you can add them to cereals, smoothies, or to your chocolate or cake recipe. Of course you can also eat it as it is.